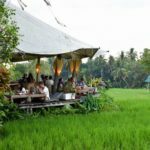 Bali food guide — 10 best local foods in Bali & best places to find them - Living + Nomads – Travel tips, Guides, News & Information! 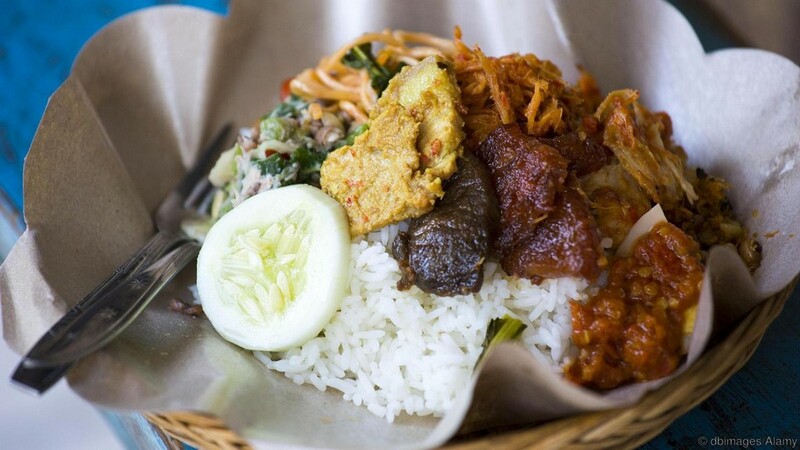 Bali is not only popular for its landscape and culture, but also for its authentic and mouthwatering food. 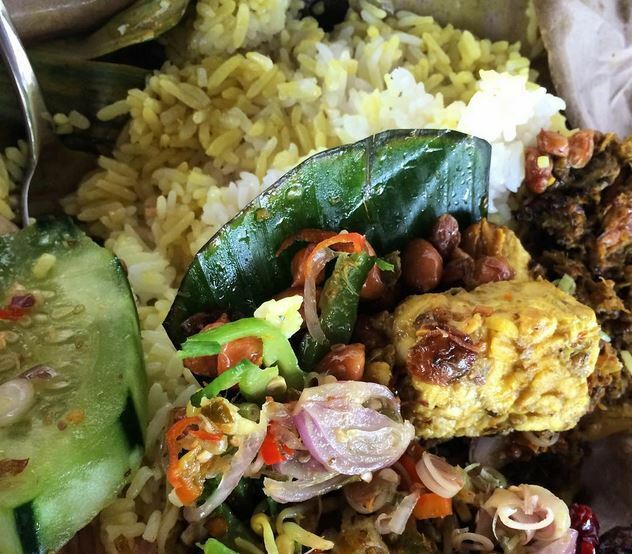 Here are 10 best local foods in Bali you must try when visiting. 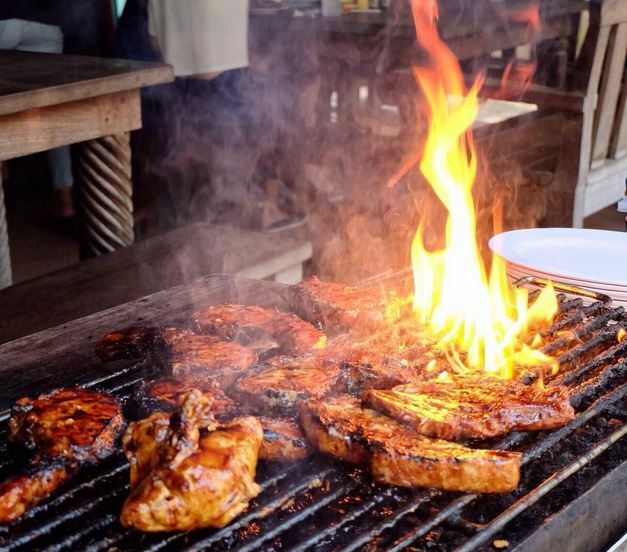 This is the most popular dish across the island – one of the things people would die for. Suckling pig Bali or “babi guling” consists of white steamed rice served with spicy, juicy roasted pig, lawar (shredded coconut, minced pork, spices and chili), pork satay, pork slices, a few pieces of crispy pork skin, some crunchy fried crackling, long bean salad, and rich soup with some veggies and chunks of bone. Our favorite spot for suckling pig is Babi Guling Sanur. 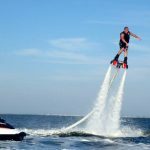 Some other places might be more popular (and can be extremely expensive), but here we guarantee this is the best overall experience. This yellowish and spicy chicken is steamed with highly-seasoned spices and chilli with coconut oil. It’s usually served with fried peanuts (to help diners deal with the spice) and plecing kangkung (a water spinach dish). Ayam betutu originates from Gilimanuk in Northern Bali, but you can get this dish in Denpasar or Southern Bali as well. Try the ayam betutu at Ayam Betutu Khas Gilimanuk. This restaurant actually has many other branches, such as in Renon Denpasar or Tabanan; you’ll remember it for its unique logo. 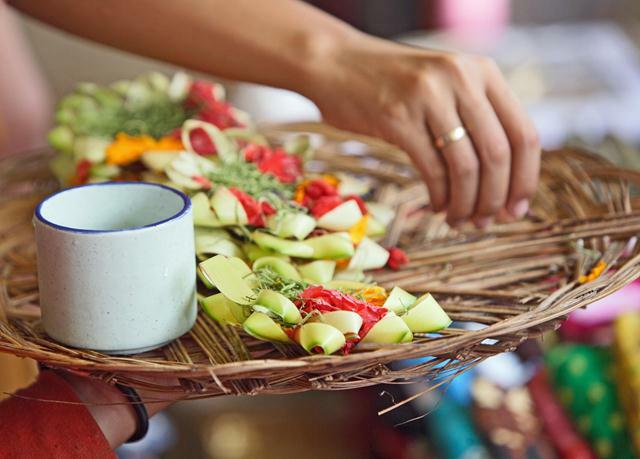 This is a set of Balinese authentic snacks, which consists of some mixed sweet dishes mostly made of rice flour, sticky rice, coconut, and palm sugar with a caramel taste. It’s a perfect dessert. Warung Gula Bali “The Joglo” sells many other types of Indonesian desserts and snacks – it’s highly recommended if you like bite-sized dishes or desserts. These tender ribs are amazingly delicious and juicy. They’re cooked slow and low with Balinese spices, grilled over indirect heat and finished with a smoke on the BBQ. It pairs perfectly with a cold beer. Our favourite spot, Naughty Nuri’s Warung, used to have one outlet in Seminyak, but it’s now closed. The only Naughty Nuri’s left is in Ubud. 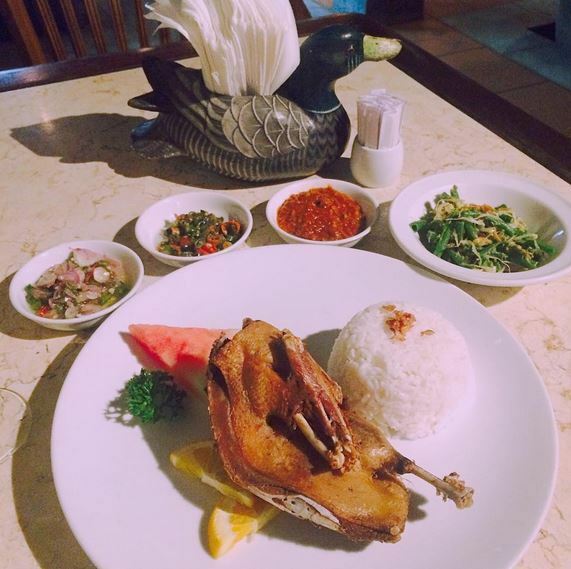 This typical dish started to be more popular when Bebek Bengil restaurant gained its fame with its crispy dirty duck. This deep fried duck is tender, with rich flavor, and crispy duck skin. 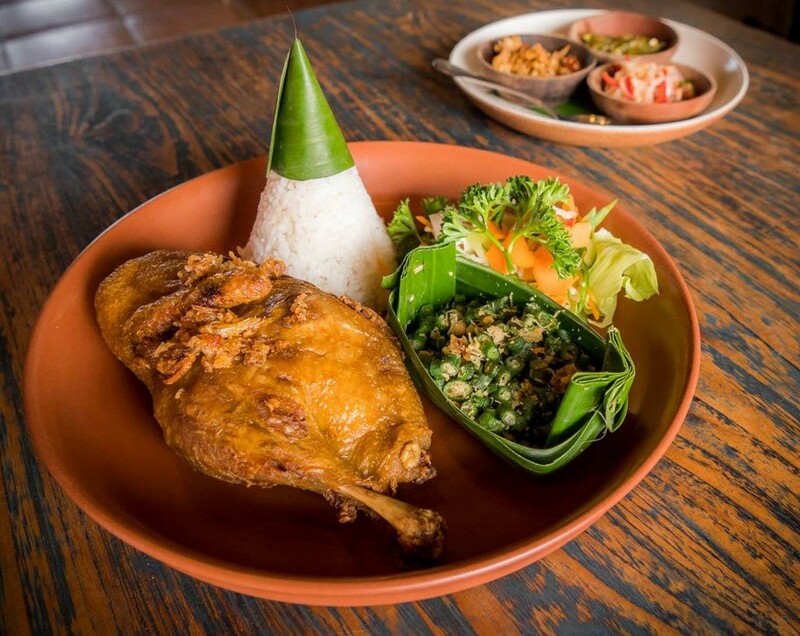 Find it at Bebek Bengil, a huge restaurant located in the heart of Ubud featuring refreshing views over neighbouring rice fields. 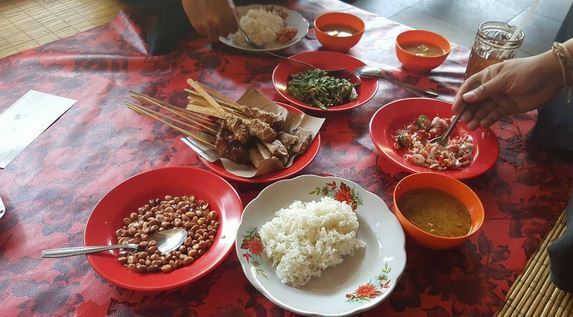 Many Balinese dishes are made with pork, and street pork satay is one of the island’s signatures. Many street vendors still use the traditional methods of building their fires using bamboo hand fans, which gives their satay a layer of flavour that sets them apart from restaurants that now use electric fans. 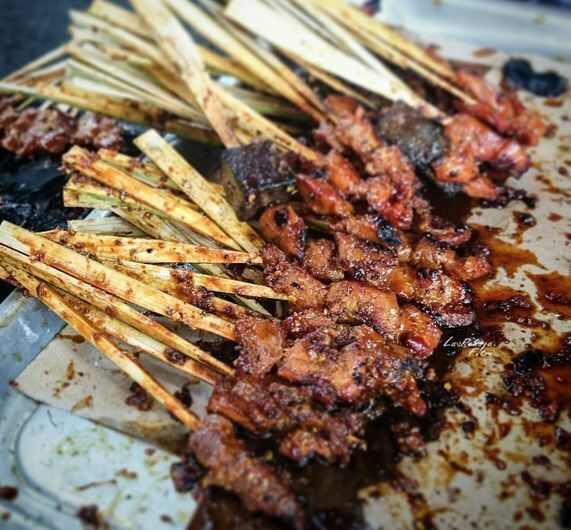 Our favourite street vendor is Sate Babi Gelora Tri Sakti. They used to only sell pork satay at dirt-cheap prices, though their recent fame has encouraged them to expand their menu and raise their prices slightly. It’s still very much worth a visit, just be sure to come before they close at 3pm. This satay lilit ikan (fish lilit satay) is a typically Balinese dish. 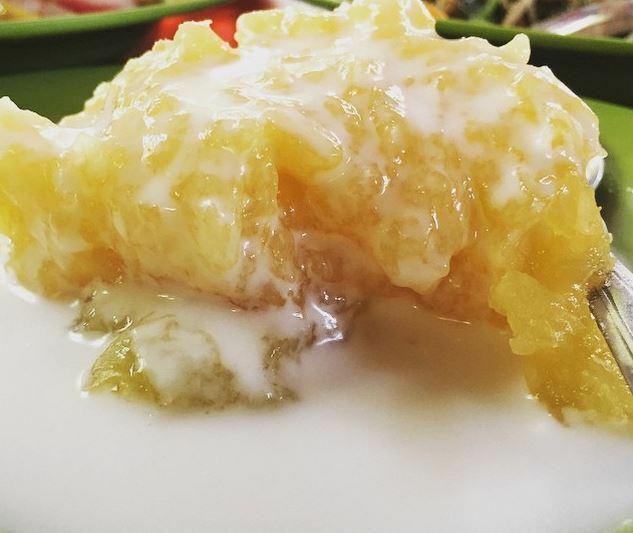 It’s made of minced fish meat and coconut milk, which is pressed onto lemongrass then roasted and served with salt and chili. The taste of lilit satay is a bit different compared to other types of satay, such as pork satay, beef, chicken, or lamb satay. Get it at Warung Lesehan Mertha Sari. 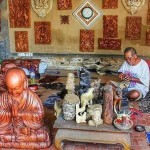 This place is a bit tricky to find, but just ask the people around Klungkung area and they’ll be happy to show you the way. The Island of Gods is surrounded by the sea, so there is no way you can visit without trying some fresh seafood. 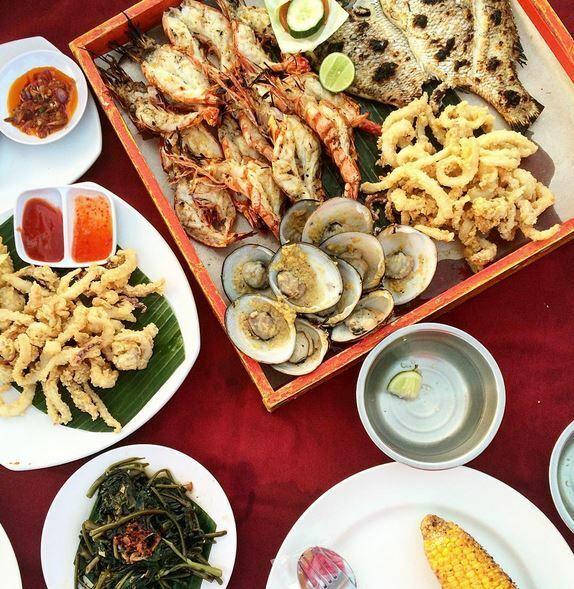 Popular seafood dishes in Bali include grilled fish, grilled shrimp, crabs with any sauce and clams. We recommend enjoying by the beach with a beer or a fresh coconut! 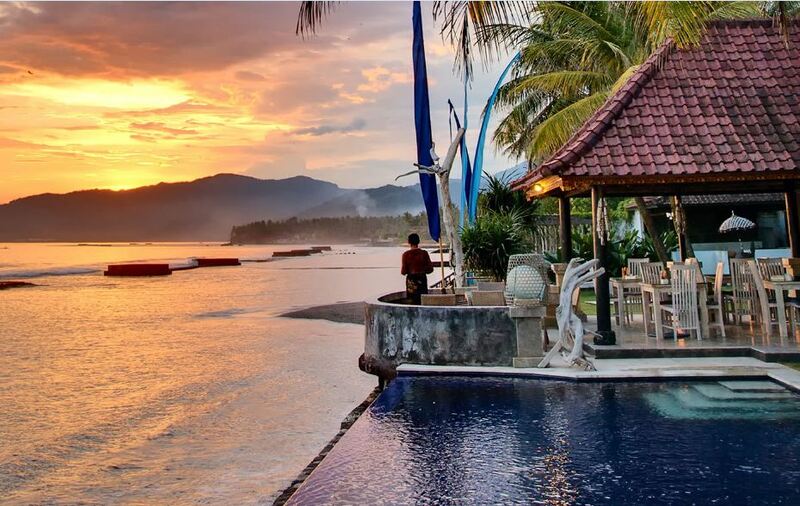 Kedonganan Beach has many seafood restaurants by the beach, and most are open for dinner. Their prices are all similar, though flavour and quality varies slightly. As a nice bonus, you might encounter some talented musicians plying their trade on the beach when you dine in. 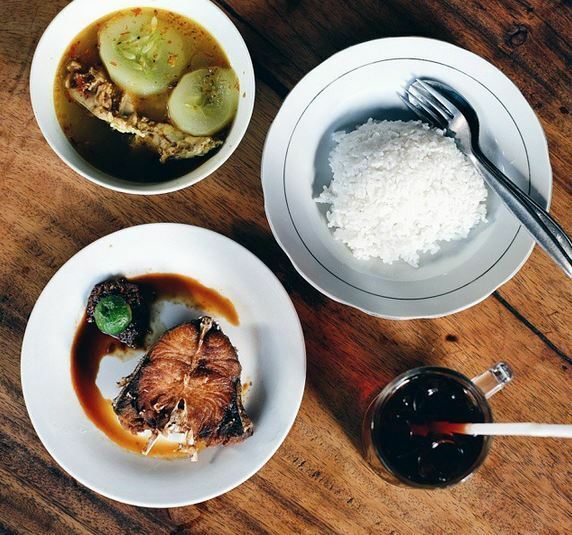 This dish is usually served as part of a set menu with white steamed rice, fried snapper with separate sambal, and spicy, salty yummy fish head soup with vegetables. These two dishes are perfect together. Just be sure to grab some napkins to deal with the sweat. 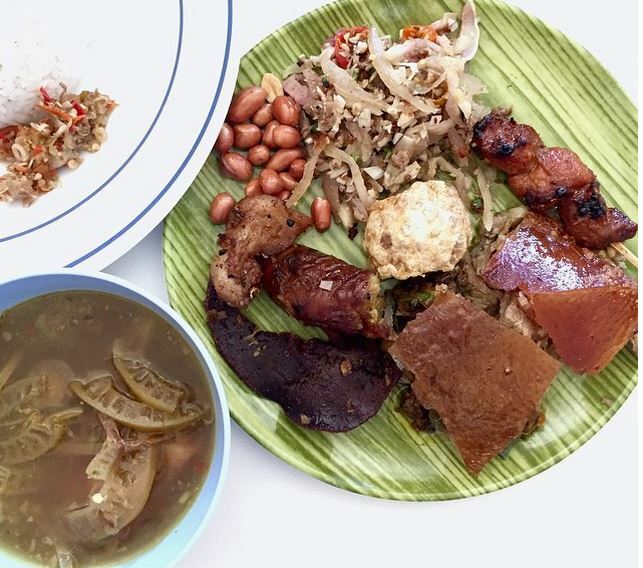 Warung Mak Beng has been open since 1941, and is very popular both among locals and Asian tourists. Seating is limited, so at peak times you might need to jockey for a good spot and swoop in on departing diners’ seats. 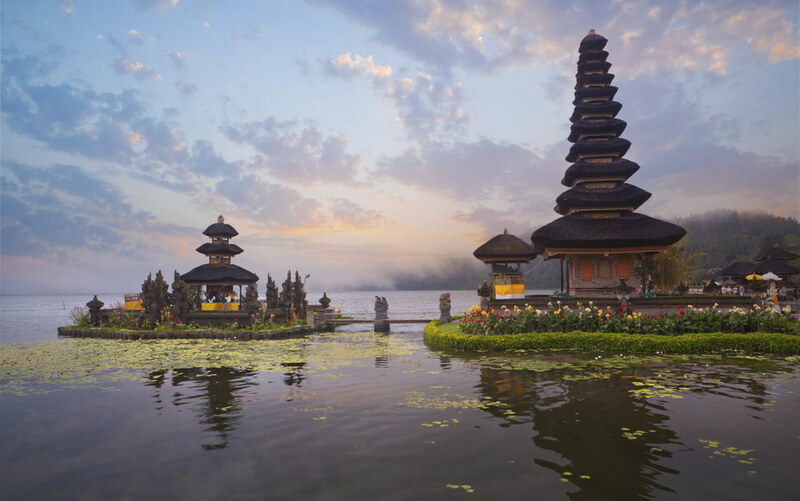 Some people only come to Bali without visiting other parts of Indonesia, which is very rich in culinary knowledge. 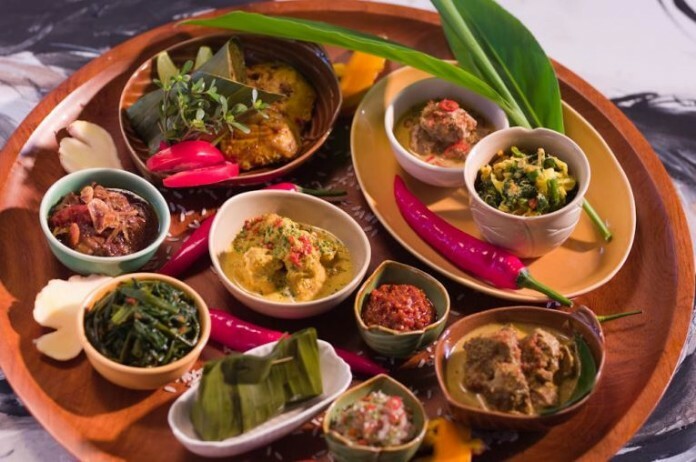 In fact, you can also try general Indonesian cuisine in Bali, such as tempeh, tofu, dishes with peanut sauce and sayur asem. 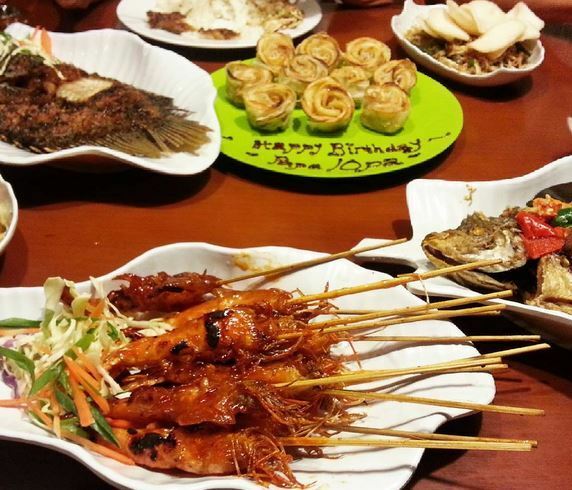 Bale Udang Mang Engking has a very comfortable and romantic atmosphere. 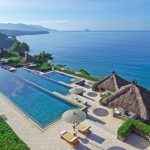 Surrounded by a vast fish-pond, it also has bale-bale (seating hut made of bamboo) and a kids’ playground with traditional instrumental music. If you come in a big group, you might need to reserve in advance to get a good seat.